So here's a fun one: you have a DMX console and an entire system that runs using it. You just bought an awesome set of LED strips for super cheap from amazon and of course, you want to use them in sync with the rest of the system. You could of course buy a DMX decoder but I wasn't able to find any decent ones for what I wanted. The MOSFETs do not need to be exactly the same model, just make sure to look up the datasheet of what you have and to wire it up correctly. Additionally note that the current draw of LED strips is high and so make sure your FET is up to it. Let's go over the basics of how this is going to work. There are two parts to making this work, the DMX conversion part and the RGBW control part. 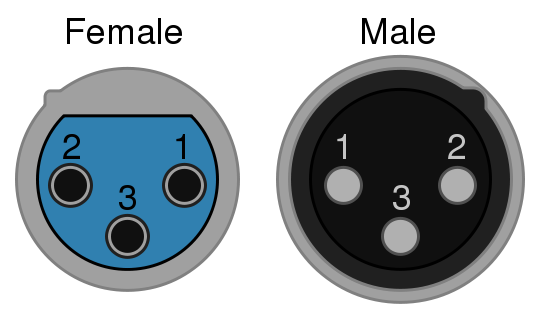 The wiring diagram below shows the connections from the table above very clearly. The next thing is to connect a male XLR connector and a female connector in series with our circuit. This simply means connecting both the male XLR and the female XLR to the output of the MAX485. An important thing to remember is that if this device will be the last one in the chain a 120Ω resistor must be added between the data lines (XLR 2 and XLR 3). This is to reduce signal bounce back, which can create very chaotic scenes if left unchecked. Now that the DMX side of the circuit is sorted, we need a way to control the LED strip. There are countless tutorials on this already but I will include a diagram and short explaination for what is going on. This is where the 10k resistors come in. They are used to keep the FET's gates low until the arduino sets them high. Many circuits found online omit this part, but if you require the output to only light when the arduino sends the command to, you will need the resistor. Important! 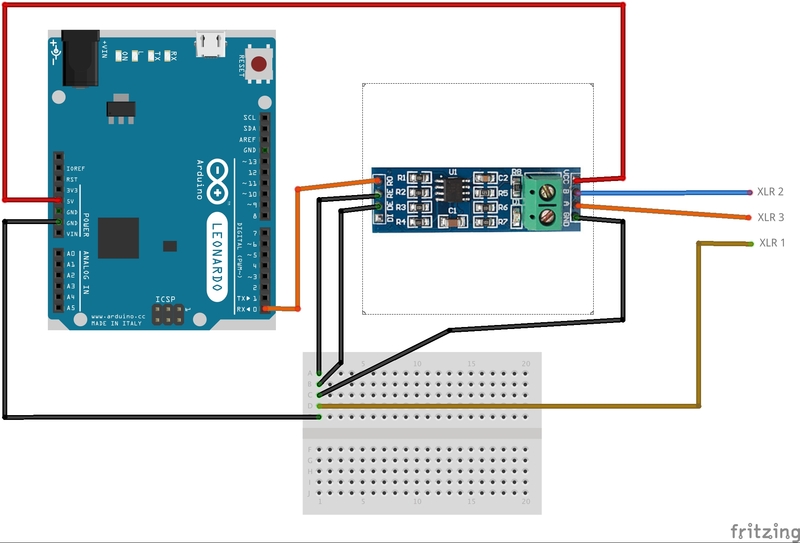 Do not connect the LED strip directly to the arduino! In most cases the LED strip will draw far too much current for the arduino, ESPECIALLY if like me, you are using a pro micro instead of the full size uno in the diagram! 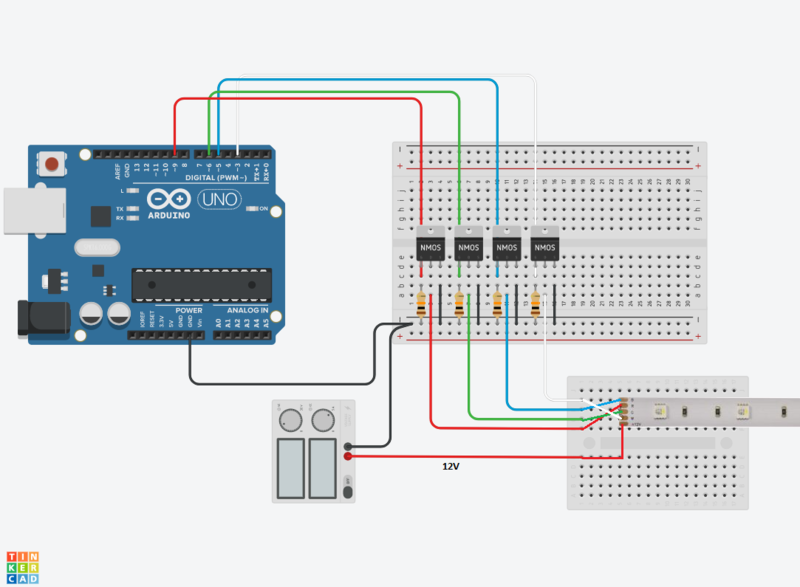 It is important however to connect the grounds of the arduino and the LED power supply together! While the pins used in the diagram are not the only pins you can use, it is important to make sure the pins you are using are the PWM pins. If your pins aren't PWM you wont be able to adjust the brightness of each color and instead you will only be able to turn them on or off. In my project, I used one of those cheap car USB chargers to convert the LED strip's 12V power supply to the arduino's 5V. If you are using the pro micro, note that from my experience anything above 5V will destroy the onboard regulator dispite it being rated for up to 12V. If you are going with this approach, make sure to use the RAW input pin to power it to ensure that if something does go wrong, it will at least attempt to regulate the power down to something it can handle. The code is a bit of a mix of a few things. It is rather simple though as it is reading data from the serial line and simply sending it back out on the PWM outputs. It uses the DMXSerial library and the source for the sample code I used is also linked. Note that DMXSerial has special instructions if you are using an Arduino Leonardo (like I was). This is because they have multiple serial UARTS and so you must select which one it must use. If you aren't using a Leonardo you will probably want to go comment out/remove the Serial.begin line because that will most likely interfere with the DMX library. // DmxSerial - A hardware supported interface to DMX. // 25.07.2011 creation of the DmxSerial library. // without using the Arduino Serial (HardwareSerial) class to avoid ISR implementation conflicts. // 28.12.2011 changed to channels 1..3 (RGB) for compatibility with the DmxSerialSend sample. // 10.05.2012 added some lines to loop to show how to fall back to a default color when no data was received since some time. const int RedPin = 5; // PWM output pin for Red Light. const int GreenPin = 6; // PWM output pin for Green Light. const int BluePin = 9; // PWM output pin for Blue Light. // Show pure red color, when no data was received since 5 seconds or more.